Latest Rajinikanth ROBO 2.O Movie Photo Gallery Exclusively. Rajinikanth, Akshay Kumar, Amy Jackson Shankar Shanmugam, AR Rahman and A Subaskaran Combination Latest Magnum Opus ROBO 2.0. 2.0 Movie is the India’s ever big budgeted movie and most expensive Indian Movie till date. The Robo 2.0 is made with budget of 543 Crores which is non Hollywood 16th High Budget movie in world. 2.0 is an Latest Indian science fiction action Movie written and directed by Indian Spielberg Shankar Shanmugam, co-written by B. Jeyamohan, and produced by A. Subaskaran. The Movie is a sequel to the 2010 Enthiranin Tamil, ROBO in Telugu and Robot in Hindi. 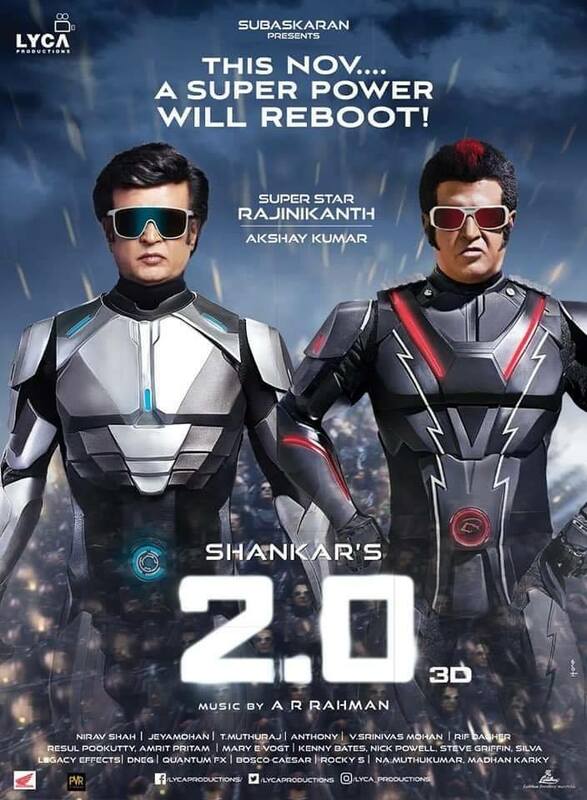 The Robo 2.0 features Rajinikanth reprising the roles of Dr. Vaseegaran and Chitti, alongside Akshay Kumar playing as Super Natural Fifth force and Amy Jackson as Female Andro Humanoid Robot. The Robo2.0 Movie is shot in Tamil language and will be released in 14 other languages with dubbed versions Including Telugu, Kannada, Malayalam and Hindi. The teaser of the movie was released on 13 September 2018,followed by a trailer which released on November 3. 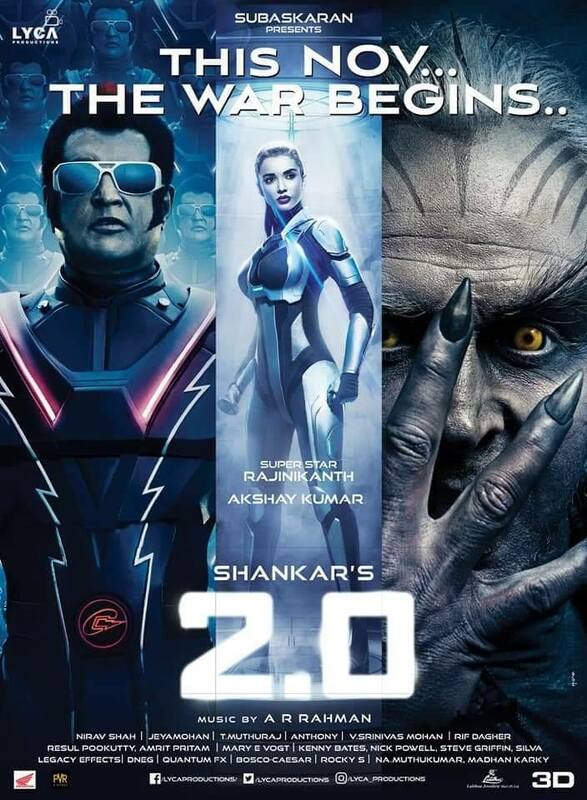 The 2.0 Movie is all set for a worldwide theatrical release on 29 November 2018.The story is based on Chitti, where he will be forced to be reassembled by Dr. Vaseegaran and the Indian Army in order to stop the Fifth force. Rajinikanth as Dr. Vaseegaran and Chitti, Akshay Kumar as Super Natural Fifth Force, Amy Jackson as Nila, Aishwarya Rai Bachchan as Sana, Sudhanshu Pandey as Shahrah Bohra, Adil Hussain, Kalabhavan Shajohn, Riyaz Khan playing lead roles. Directed by Shankar Shanmugam, Produced by A. Subaskaran, Raju Mahalingam, Written by S.Shankar, B.Jeyamohan, Music and Background score by A. R. Rahman, Cinematography by Nirav Shah, Edited by Anthony, Sound Designing by Resul Pookutty, Art Direction by T. Muthuraj, Visual Effects supervising by V. Srinivas Mohan, Production company, Lyca Productions, Distributed by Lyca Productions, Dharma Productions. Latest Rajinikanth ROBO 2.O Movie Photo Gallery Exclusively. Rajinikanth, Akshay Kumar, Amy Jackson Shankar Shanmugam, AR Rahman and A Subaskaran Combination Latest Magnum Opus ROBO 2.0. 2.0 Movie is the India's ever big budgeted movie and most expensive Indian Movie till date. The Robo 2.0 is made with budget of 543 Crores which is non Hollywood 16th High Budget movie in world.